And there’s our neighbour Josh, taking orders in his notepad with a red pen. A gentle hug hello and a quick catch up. 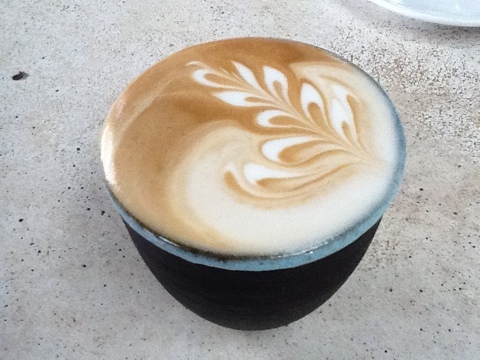 Zack doesn’t look up as he finishes off the heart and leaf-shape patterns on his cuppachinos. Choosing bread and there is Zaida, another neighbour. She’s one of the bakers, and she’s busy listening to the baguette’s ‘sing’ as they come out of the oven. ‘They sing… no, really they do… listen…’ Josh and I put our ears to the hot pile of baguettes and sure enough, there’s the sound of crackling fire inside. ‘Wow, I’ve never heard that before,’ says Josh as he dashes off in slow-motion with a breadboard piled up high. ‘I didn’t know you worked here,’ I say to Zaida. When she’s finished baking in the early morning, Zaida hangs up her apron and heads off to work at her shoe shop. 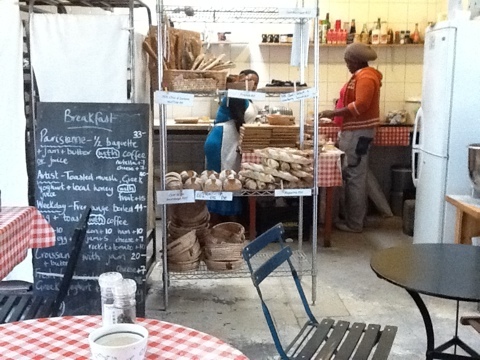 She suggests I try the ciabatta loaf: ‘it’s made with a poolish ferment’. She wraps it up with paper and string. I ‘saw’ myself work for the first time. my connection to the universe. the person next to me.. 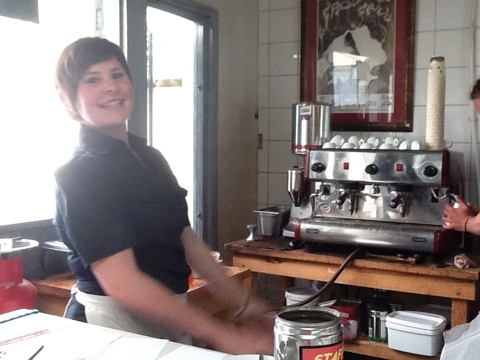 Her sister, Rachel buzzes by to pick up some coffees. Why do people adore this place? ‘The coffee is good. 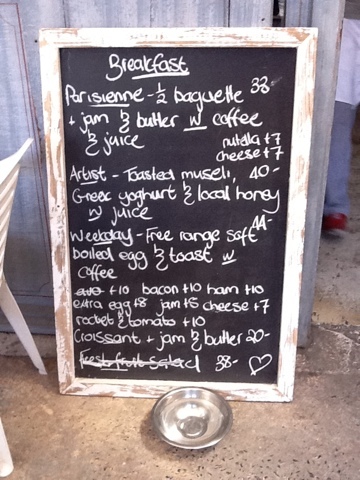 The prices are good and it’s chilled,’ says Josh. I hand him twenty bucks for the ciabatta and he mentions that he’s hitchhiking up the East coast next week. I suddenly feel the need to put a GPS tracking device on him. But he adds that he’s (definitely) coming back coz he’s studying philosophy, politics and economics at university next year. And a quick trip down to the market where the traders are still unpacking. Crossing the road, I bump into an ex-Kalk Bay local. He’s putting on his helmet. I tell him we’re staying here until the end of January to check it out. 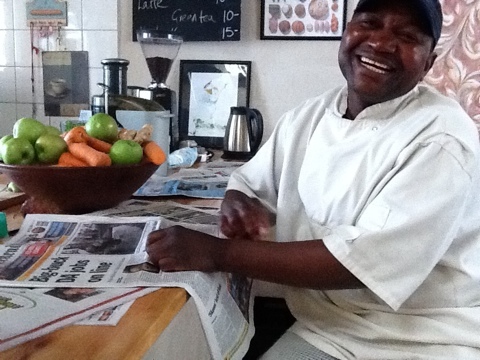 ‘You know who’s buying up Kalk Bay these days?’ he asks. ‘The whole of bloody Rondebosch! What for? To come here to their hippy weekend homes and drive around in their monster four by fours. It makes me sick.’ And off he goes on his black Japanese soul-machine. Home with Zaida’s bread still warm under my arm, a takeaway cuppachino in hand, waving to le neighbours as I open the door. 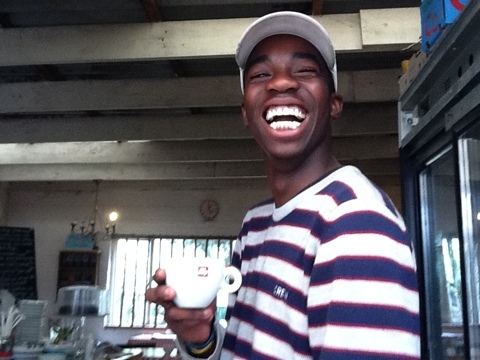 That’s the thing about living in Kalk Bay: everybody gets to be your neighbour. An inconspicuous garage door opens out of a big, bare looking building across the way from the railway line. A grim place, you’d think, but then — what is it that smells so good? There are two odd chairs just outside the garage door. What is this strange set-up? Some kind of post-apocalyptic restaurant? The answer is somewhat revealed: there lies, just inside the unexpected hole in the wall, a table which is spread across the width of the door area. It is laden with breads, muffins, scones and rustic fruit tarts. Behind the table is an open plan kitchen. And in the kitchen are two men dressed in blue-black aprons. But then, if this was a restaurant, surely there would be a sign? Not necessarily a shop sign but at least a menu of some kind? Surely there’d be some pedestrians, passers by? Some foot traffic? Yet here these guys are, in the middle of nowhere with splatterings of flour on their aprons, a telltale sign that they have just finished an early morning shift. I sit down on one of the chairs but there’s not even a breezy blackboard marking out the day’s offerings. ‘So, what do you make, I mean, what can I order?’ I ask. I follow his eyes to find three boxes perched neatly in a row on top of what looks like an electricity box. The box is high up on a blank canvas of a wall. And as he tries to read the labels from afar, I’m losing all perspective and rising into a bit of a cloudy state of mind. I’m baffled by this sense of timeless unhurriedness. This sense of ease, of no-marketing-required. The mysterious place is a bakery, it turns out. It’s existed for some time now. Orders have been delivered by bicycle to date. Now the owners have decided to open up the wall and invite the early morning sun in. And whoever purchances to find themselves in the backstreets of this neighbourhood. ‘What is this place called?’ I ask the chef in the peak cap. I’m forgetting about the tea and so is the man in the cap. He’s answering more questions and saying ‘ohhhh, how I love making puff pastry’ as he finishes off a butternut pie. We are both in agreement that pastry is all wrong when butter, flour and eggs are taken out of the equation. Next thing I’m inside the kitchen checking out the starter dough. The baker is stretching it out into a thin sheet. He’s showing me the ‘skin’ and the action of the gluten and explaining the texture. That characteristic sour yeasty smell is drifting out of the sweet, snug warmth of the dough. These chefs well know the joys that come from baking. Suddenly I am handed a large chunk of freshly baked bread. It’s topped with a pile of pale yellow butter. What a gift. But then, I thought it was only my father who put this much butter on his bread! I bite into the crispy stuff with its ladles of soft yellow. ‘Homemade, fresh from the farmer as it came from the cow.’ The lightest butter I’ve ever tasted. It really is like cream. Nothing like the heavy butter from a supermarket. I look around: coffee mugs snuggle up to measuring scales. Baking tins are stacked on shelves. The pies are just out of the oven. This is a place where things are ready when they’re ready. Where you’ll see not a clock on the wall. Several people have popped by in the meantime including Shaun, an artist and Directed Pressure Point Technique practitioner who works above the bakery. And Nic, the carpenter from next door who still seems bowled over by his next door neighbours’ bread. 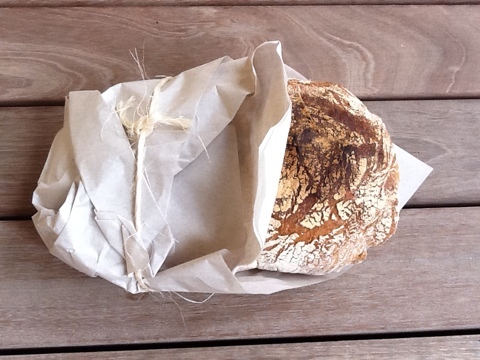 I pick up a farm loaf and wave goodbye to one of the proprietors who is getting his hands dirty again. He is merrily picking up litter off the railway line. The ‘sometimes fantastic, always good’ bakers Mitchell Penning and Martin Mossmer are pictured above. 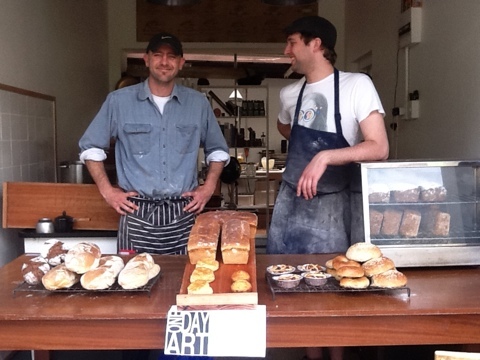 You’ll find The Good Food Bakery at 12 Milner Road just across the road from the railway line crossing to the right. 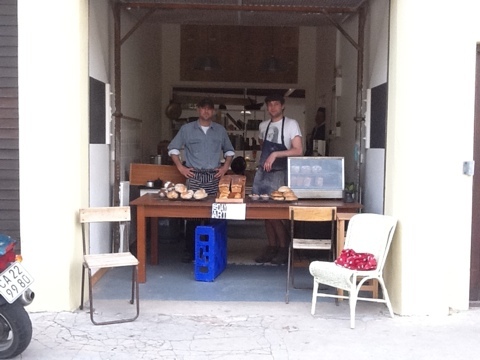 You can contact them on 074 174 5554 or email them at thegoodbakery@webmail.co.za. They’re open from 6.30 until 3.30 pm.